Was this boy just a phantom, a glitch? Or does this data tie into hurtful memories that sleep within Sora's heart? 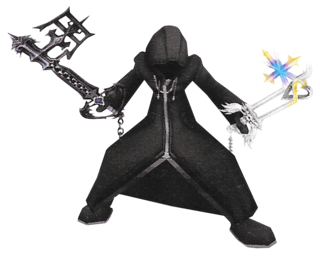 Sora's final and most formidable opponent in Castle Oblivion, a mysterious figure who attacked with not one Keyblade, but two. Data-Roxas is the final boss that appears in Kingdom Hearts coded and Kingdom Hearts Re:coded, and reappears in a bugged form as a post-game boss in Kingdom Hearts Re:coded, in the LV80 System Area at Hollow Bastion, on the 13th floor. Data-Roxas uses the same Dual-wielding ground and aerial combos from Kingdom Hearts 358/2 Days. He also uses his "Magic Hour" Limit Break, in which he uses the Final Limit version when his HP dwindles lower. 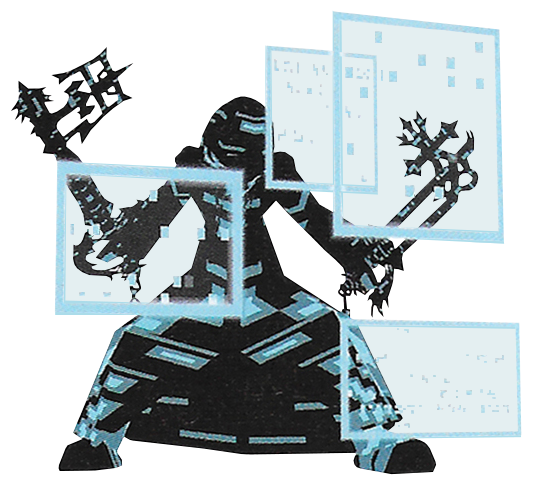 He also maintains his ability "13 Beams" from Kingdom Hearts II Final Mix which may inflict Clock Rewind status effect. His ground attacks have a chance of inflicting the Command Lock status effect and his aerial attacks have a chance of inflicting Flip-Foot status effect, so make sure to block or avoid his attacks when necessary. However, one may also make use of projectile-based commands as often as possible, but may still have to watch out for Roxas's ranged attacks in order to avoid them on time. Defeating Data-Roxas within five minutes grants Data-Sora the Oathkeeper. A bugged Data-Roxas appears within Hollow Bastion's last System Sector, which is unlocked after beating the game. His abilities are the same as the normal Data-Roxas, but with a larger amount of HP and immense strength. When his HP dwindles lower and lower, he will get a stat boost, changing in the following manner: Normal, then a Speed Boost, then a Strength Boost, then a Projectile Boost. During this battle, the floor trial requires Sora to activate a Finish Command in 45 seconds. This is simple, but not easy to do since Bug Data-Roxas's 13 Beams can inflict Clock Rewind status effect. The player can avoid this either by equipping the Heat Sink Belt or by attacking Data-Roxas using carefully-timed powerful projectile commands while also avoiding his ranged attacks. When the trial is done, focus on his attacks and follow the Data-Roxas's strategy, and this floor of the System Area will be done in no time. This page was last edited on 14 March 2019, at 19:03.